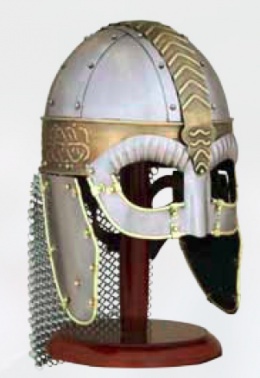 This fantastic viking helmet comes richly adorned with brass decoration and trim. It is hand crafted from 18 gauge steel and features an adjustable leather spider and chin strap. Comes complete with butted chainmail aventail. Features include:-Brass decoration -18 gauge steel -Chainmail aventail -Circumference 63cm (25inch)-Height 36cm (14.5inch)-Length 20cm (11inch). Norse warriors wereknown for their attempt to emulate the fury and prowess of animals, this Viking Wolf Helmet is likely an attempt to harness the power of the wolf, creating a berserker-warrior blessed by Odin. Today there is only one known example of a complete Viking helmet in existence. This Viking helmet was excavated on a farm called Gjermundbu in Ringerike in central Norway. Gjermundbu is located in Haugsbygda, a village in northeast of Hønefoss, in Buskerud, Norway. This page was last modified on 8 June 2014, at 15:10.